WHEN the results of the 14th general election were finally formalised early Thursday morning, showing that Pakatan Harapan had won and would form the new government, there was a sense of excitement among its voters over the reforms promised by the incoming administration. At the same time, that wave of buoyancy was tinged with worries of uncertainty. Malaysia was taking a path not traversed and for financial markets, anxiety is something they have never digested well. Prime Minister Tun Dr Mahathir Mohamad since then has moved swiftly to inject confidence and stability among investors and the population. His swearing in as PM and the announcement of key ministries in the Cabinet will help in soothing nervy investors ahead of Monday when the stock market opens. The early movements of the stock market will be closely watched and that is something Dr Mahathir too has quickly sought to assuage. He tried calming anxious investors by saying he expects the stock market to see its capitalisation increase over time. He also assured businesses and investors that Malaysia remains business-friendly and the economy is among his top priorities. 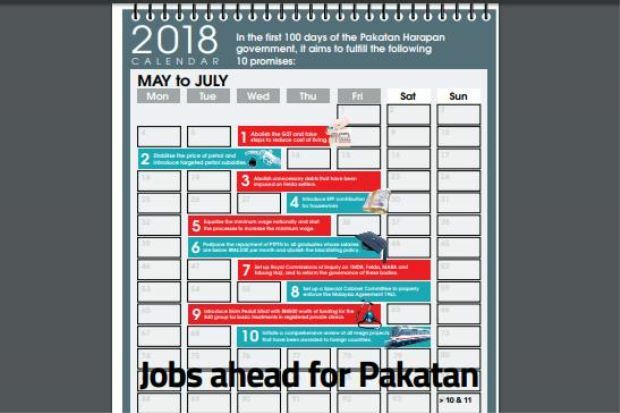 Hints of what businesses and investors can expect are laid out in Pakatan’s manifesto and its to-do list within the first 100 days. Central among the pledges is the confirmation that the unpopular goods and services tax (GST) will be cancelled and replaced with a sales and services tax (SST). The other measures it intends to carry out in the initial period is to reduce the cost of living, stabilise the price of petrol and introduce targeted petrol subsidies, abolish unnecessary debts that have been imposed on Felda settlers, introduce EPF contributions for housewives, equalise the minimum wage nationally and start the processes to increase the minimum wage, postpone the repayment of the National Higher Education Fund Corp or PTPTN for all graduates whose salaries are below RM4,000 per month and abolish the blacklisting policy. It also plans to set up a Royal Commissions of Inquiry into 1Malaysia Development Bhd, Felda, Mara and Tabung Haji and reform the governance of these bodies. A Special cabinet committee to properly enforce the Malaysia Agreement 1963 will be set up. There are plans to introduce the Skim Peduli Sihat with RM500 worth of funding for the B40 (low-income) group for basic treatment in registered private clinics, and initiate a comprehensive review of all mega-projects that have been awarded to foreign countries. What impact the measures will have on government finances is another source of uncertainty but Socio-Economic Research Centre executive director Lee Heng Guie feels it’s too early to assess any impact. “We will have to wait and see if Pakatan will table a new budget. The current estimates are based on the old budget, but I believe the Pakatan budget will continue with fiscal consolidation,” he says. Pakatan’s alternative budget projects for a smaller fiscal deficit of 2.04%. AmBank Group Research chief economist Anthony Dass says there needs to be some clarification on the new government’s policy and strategy without risking the ratings. “Removing the GST and introducing the SST and other subsidies will act positively on the economy, as they help to improve the disposable income of households, and thus, spending. This will help buffer any shortfalls from the GST. Besides prudent financial management as we have seen in Selangor and Penang, a more transparent public procurement system or tendering process will improve competition and lower margins for players and ease budget strains,” he says. Improving disposable income: Central among the pledges is the confirmation that the unpopular GST will be cancelled and replaced with the SST. Among the to-do list for its first 100 days in office, it is the promise to repeal the GST that has rating agencies worried. “We are closely following the developments around some campaign promises that could have a negative impact on market sentiment and trigger volatility in the financial markets. These dynamics will take time to unfold and a lot will depend on what the new Government unveils in the coming weeks and months,” says Moody’s Investors Service Financial Institutions Group vice-president Simon Chen in a statement. He did, however, say that Malaysia has weathered challenging periods, in particular, during the 1MDB scandal. Fitch Ratings in a statement says the May 9 results means a higher likelihood of fiscal and economic policy change. “The extent to which the new government’s agenda will shift major policy is uncertain, but the Pakatan victory and its policy platform indicate a much greater potential for change. 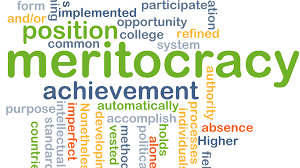 In the meantime, Fitch will monitor the new Government’s policy agenda as it evolves,” it says. It views policy slippage leading to deterioration in fiscal discipline and higher government debt or deficits as a negative rating sensitivity. “Among the most notable proposals is the replacement of the GST – a value-added tax launched in 2015 – with the narrower SST that had preceded it. The GST has become a key source of government revenue, accounting for 18% of total revenue equivalent to just over 3% of gross domestic product (GDP) in 2017. “By comparison, the SST accounted for only 8% of total revenue and 1.6% of the GDP in its last year, 2014. As such, absent offsetting measures, the replacement of the GST would result in a correspondingly higher deficit,” it says. Lee: We will have to wait and see if Pakatan will table a new budget. Fitch points to another significant proposal, which is to reinstate some of the fuel subsidies. It says that if fuel subsidies were to be reinstated, they could offset some potential budgetary gains from rising oil and commodity prices. Maybank Investment Bank in a report says that the removal of the GST will mean a projected revenue loss of RM44bil based on the current budget estimates. It says that even if the GST is replaced by the SST, which brought in RM17bil in 2014, there could be a prospective loss of RM27bil in government revenue and that could lift the budget deficit by 1.9 percentage points. The report, however, does point to Pakatan’s alternative budget released in October 2017, which says that abolishing the GST will stimulate the economy and raise other tax revenues by boosting consumer and business activities. It says tax revenues will rise from better economic growth, higher receipts of corporate income tax, real property gains tax and other sources of income. Government expenditure is also expected to drop by cutting certain allocations such as for the Prime Minister’s Office that can help buffer the cost of the GST removal. It says that operating expenditure could be improved by having open tenders and the rationalisation in non-critical spending from supplies and services, which accounts for 14.4% of operating expenditure, grants and transfers to state governments and statutory bodies (9%) and the others’ category (7.8%), which consists of grants to statutory funds, public corporations and international organisations as well as insurance claims and gratuities. Higher oil prices, however, are a revenue source for the Pakatan government and can help mitigate the loss of income from the removal of the GST. Maybank’s analysis shows that for every US$10 rise in the crude oil price, government revenue will rise by between RM7bil and RM8bil. That increase will have to be balanced out by the Pakatan manifesto’s pledge to give higher royalties to Sabah and Sarawak, and petrol subsidies. Fiscal consolidation will mean there will likely be an impact on economic growth, as government expenditure plays an important role in generating growth. Economists are, however, optimistic that consumption boost from lower prices from the removal of the GST will help buffer any shortfall from spending. They feel that the policies that will be rolled out in the coming months will be positive for the market and economy. “We reiterate our -2.8% budget deficit to GDP for 2018 with the GDP to grow around 5.5%, supported by domestic demand and exports on the back of a stronger global GDP,” says Dass. Maybank is keeping its 2018 growth target at 5.3%, pending details on Pakatan’s economic policies. “We are neutral to positive on the consumer spending growth outlook, based on Budget 2018 and Pakatan’s GE14 manifesto on measures to address living costs and boost disposable income. The main issue on the growth outlook now is investment, as businesses adopt a ‘wait-and-see’ stance and amid potential government reviews of several China-linked infrastructure projects and investments,” it says. The investment climate, though, will be crucial in generating higher economic growth for the new government. Lee says investor-friendly policies are important and the next three to six months will be important after Cabinet positions are filled and their work starts. “Dr Mahathir’s strong track record, added with Datuk Seri Anwar Ibrahim as the prime minister-in-waiting and the maturity of Malaysians as reflected in this GE, augur well for the country. These are positive signs on the business and consumer confidence,” says Dass. Najib and Mahathir face off in fierce Malaysian election: https://news.cgtn.com/news/ 3d3d414f33517a4d77457a6333566d 54/share.html ..